Here at Michigan Custom Machines, we test millions of cam phasing valves every year in the USA and across the globe. Is your company one of the lucky ones? Variable camshaft timing or VCT was developed by the Ford Motor Company to uphold top engine performance while sustaining a high level of fuel economy. This technology can most often be found in the 3.7-liter V-6 and 5.0-liter V-8 Ford Mustang engines. Borg-Warner’s Cam Torque Actuated (CTA™) VCT system is commonly used in both of these engines. Cam phasing allows for improved fuel efficiency, reduced emissions while working to avoid compromising engine performance by using pressurized oil to adjust the valve opening and closing. 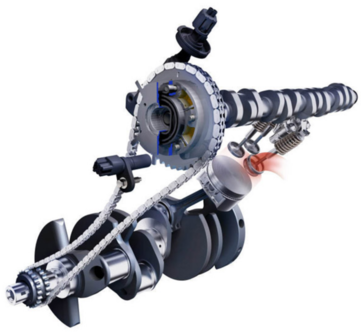 Thus improving off the line acceleration over vehicles without variable camshaft timing. All of this valuable information is stored for easy retrieval and evaluation. Each testing cycle lasts approximately 30 seconds per head. MCM’s dual scara robot solution, configured with multiple heads has achieved a throughput as short as 5.7 seconds. Vision inspection and laser marking is fully integrated into our equipment by our in house controls engineering team. Each one of our machines is strategically designed and built to fit the current needs of our customers, while considering the future for envelope size and up lift possibilities. Mechanical, electrical, hydraulic, robotic programming, PLC and HMI engineering are all completed in-house at MCM Inc. With over 22 years of experience designing and building custom testing equipment, why go anywhere else? Visit Michigan Custom Machines or call Craig Antenucci at (248) 875-5859, to discuss your next testing needs.